Since I started My Art Everyday something has changed in my out look and attitude. It is all good. Part of why I wanted to do this is because where I live, Florence, Oregon, has some of the most depressing weather ever. It is not just me who feels this. It is constantly dark, overcast, raining, and lets us not forget the constant cold wind. Sunny days are few even in summer. So to help with this SAD I started creating everyday no matter what. It has helped with my happy zone and the fact that I can see my improvements. 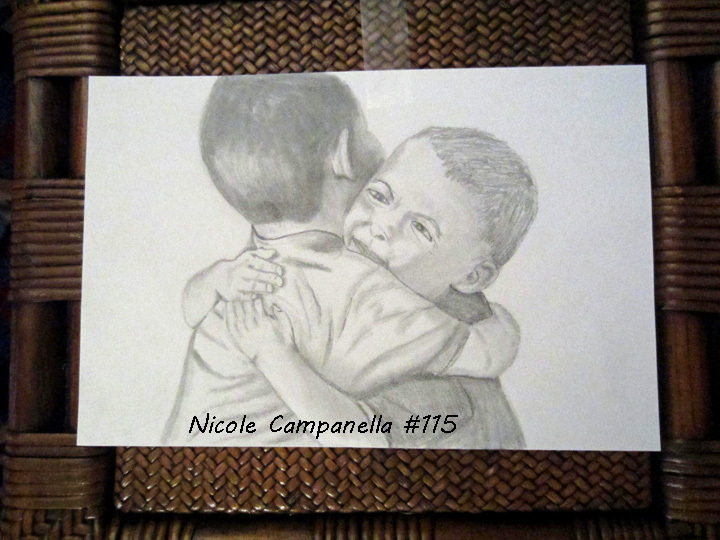 Now I am still a novice at drawing and I still have a lot to learn, but I am happy with this #115 finished pieces of art in 115 days. Your weather sounds an awful lot like ours here in the far north of Scotland. It does get quite depressing when everyone talks about the hit summer days where they are and we are lucky to get maybe a few days all summer where it's warm enough to sit in the garden. It's great the creating is helping to lift your mood. Is a catch 22 as I find that, because we have so little light in the winter months, I barely create at all. Now though, even if it's still wet and cold we get much lighter and longer days and it makes me much more creative as i can stay out in my studio long into the evenings. Congrats on getting creative every day. I should really try it! This is so beautiful and sweet Nicole... I love it! I am sorry about your weather and that it can get you down. Hi Nicole, you've drawn such a dear little scene. Hi Nicole, your drawing is very dear. Love, Love, Love Nicole!! Isn't it amazing how art lifts us!! Big Hugs!